The moment I saw Meryl Streep’s meticulously aged and slightly unrecognizable face in Iron Lady, two words inevitably leaped to mind: Oscar nomination. This isn’t necessarily Streep’s fault, but thoughts of future encomiums automatically seem to crop up whenever Streep appears in a movie that requires an accent. And in this case, Streep’s not only playing a famous and controversial woman, she’s playing someone suffering from dementia, which turns over an additional Oscar trump: the disease card. I don’t meant to diminish Streep’s achievement, which is considerable, but she — like everyone else — must live with a reputation, and I think it says something (not necessarily positive) that you may leave Iron Lady talking more about Streep’s performance than about the woman she’s playing. Thatcher, of course, is a movie-worthy subject. The former British Prime Minister — more or less Britain’s answer to Ronald Reagan — spent 11 years trying to dismantle Britain’s version of what conservatives pejoratively call “the welfare state.” I’m always wary of politicians who want to save their countries from decline, and Thatcher was that kind of leader. The daughter of a grocer, she thought that hard work and grit were life’s great cure-alls. Whatever you think of Thatcher, it’s fair to say that Iron Lady misses the mark. Streep may be pitch perfect as the doddering Thatcher, but the movie spends entirely too much time on this part of the prime minister’s life, which is sad but not nearly as interesting as her rise to power — first as a member of Parliament, then as Secretary of State for Education and Science, then as leader of the opposition party and, finally, as prime minister. As directed by Phyllida Lloyd, from a script by Abi Morgan, Iron Lady falls victim to its own flashback structure. While recalling her past, Thatcher wanders about her quarters having conversations with her dead husband (Jim Broadbent), whom we see. Thatcher’s canny enough not to conduct these hallucinatory talks in the company of others. Because she’s smart and practiced, Thatcher knows how to maintain a decent front, although the people closest to her — notably her daughter (Olivia Colman) — know what kind of shape she’s in. Thatcher seems to miss her son Mark, who lives in South Africa and who remains unseen throughout the proceedings. Streep and Broadbent have some nice moments together, and Broadbent seems to capture some of Denis Thatcher’s pluck, even though we only see him as a figment of his wife’s imagination. Although she doesn’t look like Streep, Alexandra Roach does an equally nice job as a young and upcoming Thatcher, a woman who begins to explore a political career and who is encouraged by her beau and future husband (Harry Lloyd). Credit Lloyd with pulling off a tricky bit of business; he looks nothing like Broadbent, but somehow manages to suggest that he grew into the man we meet in Thatcher’s delusions. The movie’s 13-member make-up department, which includes prosthetics people, a contact lens optician and a silicone technician — turns Streep into Fort Thatcher, an imposing and fortified woman whose frailties have begun to show through. 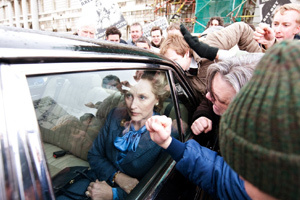 Streep looks too much like Thatcher in her dotage and not enough like Thatcher in her prime. Maybe it doesn’t matter: She has some pleasingly arch scenes with the men who surround her, listening to their advice while retaining a sense of independence and authority that ultimately veers into tyrannical dominance. But as the movie fluctuates between Thatcher’s addled present and her powerful past, it can’t seem to decide whether to applaud her feminist pluck or condemn her political ego. And in dealing with such matters as Britain’s war in the Falklands, I’m not sure Iron Lady takes much of a position at all, except to say that the victory restored Thatcher’s waning popularity. So, yes, Streep no doubt will get her Oscar nomination, but we didn’t need a movie about Margaret Thatcher to tell us that it’s sad to watch a once-commanding person ravaged by dementia or that a long marriage has its tender moments or that an ambitious, intelligent woman worked hard to become one of the most powerful people on the planet. And we certainly didn’t need a movie that doesn’t seem to know which of those things qualifies as most intriguing.